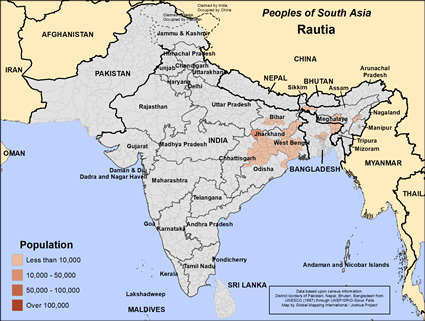 The Rautia or Rautas live in northeast India. According to legend, they were a tribal militia who helped a prince and received land as a payment for their services. Their name Rautias means "lesser Rajput." After receiving their land, they took up the profession as farmers, a job deemed below the status of a Rajput. The Rautia live mainly in villages with other castes. They grow rice, wheat, millet, sugarcane, vegetables and fruit on their farms. Some Rautias have moved to cities and taken up other occupations such as factory workers, public administrators and shopkeepers. In 2016 the Rautias were granted scheduled tribe status by the government. Many Rautia are unable to read and write. They are now eligible for guaranteed government jobs and university admissions. The primary language of the Rautia is Hindi and a dialect of Hindi called Sadri. The Rautia live in the Indian states of Jharkhand, West Bengal and Bihar. Most of the Rautia people live in a similar way as their ancestors did, tilling the soil of northeast India. Many of their villages do not have electricity, access to clean water or indoor plumbing. Many young Rautias have left the rural life to pursue educational and economic opportunities in urban centers. The eldest son in many Rautia families inherits all or half of his father's property. It is the duty of the eldest brother to give land and property to his younger brothers. The Rautia generally marry within their own caste. Often they marry their cousins. They sometimes will marry outsiders who have nearly the same rank as theirs in the Hindu caste system. The Rautia bury their dead. They employ Brahmins to officiate at their important family rituals like births, weddings and funerals. Caste councils promote their interests and settle legal disputes. The Rautias practice Hinduism, the ancient religion of India along with folk religion. The Rautias venerate their ancestors and try to ward off evil spirits with rituals. The Rautias worship and serve the gods of the Hindu pantheon. Hindus believe that by performing rituals and good works that they will attain moksha or freedom from the endless cycle of birth, death and rebirth. The Rautias visit Hindu temples and offer prayers, food, flowers and incense to their gods. There are many forms of Hinduism, each with its own deities and beliefs. The main yearly holidays of the Rautias people are Holi, the festival of colors, Diwali, the festival of lights, Navratri, the celebration of autumn and Rama Navami, Rama's birthday. The Rautias need to hear the life-changing message of Jesus Christ in a way they can understand. They need to see the love and mercy of Christ lived out before them in practical ways. They need help in educating their children and in gaining access to modern medicine. * Pray that the tiny number of Rautia believers would grow and be established in the faith. * Pray that many of the Rautia people will come to love God with their whole being and will walk in His ways. * Pray that God will overthrow spiritual forces of darkness opposing the spread of His gospel among the Rautia people. indpaedia.com/ind/index.php/RautiaView Rautia in all countries.